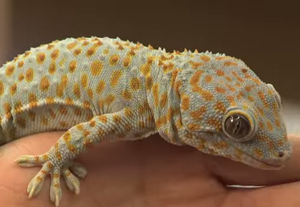 Researchers at Stanford University have created gecko-inspired adhesive grips that can help humans climb more efficiently, and may provide a better grip for robotic arms in factories, and possibly even in space. The new adhesive technology--discussed in this month's Journal of the Royal Society Interface--could be used in manufacturing equipment, grippers for manipulating solar panels and displays, and other objects. There potentially would be no need for suction power or chemical glues. The research team, led by engineer Mark Cutkosky, has also begun working with NASA's Jet Propulsion Laboratory to adapt the adhesive for use by robots. The research was inspired by the sticky feet of geckos, whose toes are incredibly sticky because they are covered with groups of long, thin spatula-shaped structures known as setae. The setae are able to increase surface area and amplify weak electrical attractions between the toes and a surface, allowing the gecko to stick to any surface, as well as release when shifting weight between feet. They also have the unique ability to retain their stickiness throughout the gecko's lifetime, unlike most man-made adhesives that have a shelf life. While the early applications appear to be more industrial, there's hope that this kind of technology could make its way into the realm of medical adhesives. Earlier this year researchers at Boston Children's Hospital began work with a new surgical adhesive that they hope can replace sutures, and possibly be used to patch a heart. They've even begun looking at biodegradable adhesive substances that can be used inside the body before absorbing naturally into your system. When designing the adhesive for this transformative new climbing system, researchers started with an existing adhesive based on molded microwedges, made from a polymer material called PDMS. They then attached tiles of this material to a flat, hexagonal, hand-sized gripper. Each gripper was then backed with a spring that distributed weight across the pad, helping to absorb some of the force involved in climbing. To make the climb even easier, researchers also linked the grippers to a platform for a person's feet, enabling the climber to transfer the work of climbing to the legs. The next step for researchers is to continue to test the adhesive in less friendly conditions, as they look to test its abilities in humidity, rain, dust, and other extreme conditions. This month they even tested the adhesive in a zero-gravity airplane with NASA to test its capabilities, and were astounded with its ability to work efficiently. Find out how a team of scientists at the University of Massachusetts (UMass) has developed a reusable adhesive inspired by geckos.